Today I was at the BDN office (where I intern at; the Boonville Daily News) when I found this piece of cloth with a bunch of Model T's on it. I can't say when the piece was published (that was cut off) but I'd say 1970s or so. I have a better image that was scanned in I can post if the one isn't good enough. The other version has to be scaled down so it will require some editing but I can post it if needed. 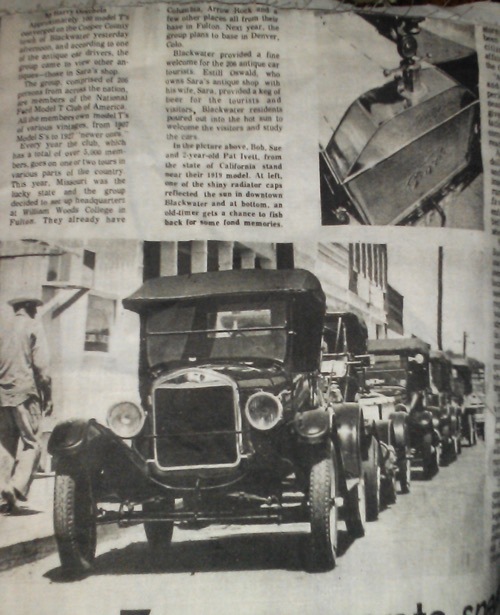 Also; forgot to add that it does mention the Model T Ford Club of America in the article. Maybe a scan of just the text would be readable. Less shrinkage needed if done separately from the pictures. MTFCA Nat'l tour 1976, Kingdom of Calloiway, Fulton MO. I had my learners permit and because my Grandfather was in a nursing home in Florida the trip was just my Father and myself. A week of Model T's and guy time. HOT as HELL, several days over 100, both the temp and humidity. Got a chest cold from the air conditioning that took 6 months to get rid of. We stored the T on the trailer out at John D.'s farm for the next week so we did not have to drag it to FL. IT was the last time I saw my grandfather alive. Stopped in NW Georgia for breakfast and tried Grits for the only time in my life. It rains a lot in Florida in July.